Oops - we don't appear to have a video for the Documate 515. We ordered our scanner some months ago, the website was easy to use and the process to order straight forward. It was delivered within a few days. We use the scanner every working day without issue and it gives us good quality images. Would recommend to any office scanning up to 1000 sheets daily and rate it a 5. The Xerox DocuMate 515 scanner is a compact and effective high speed scanner which is perfect for workgroups and other decentralised scanning applications, enabling businesses to achieve high levels of productivity by distributing fast, cost-effective scanners through out the organization. 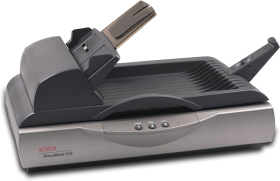 The DocuMate 515 has a 50 page Automatic Document Feeder that scans 15 pages per minute. It features 600 dpi optical resolution, 24-bit color, hi-speed USB 2.0 interface and scans everything from photos up to legal size documents. It also features one of the smallest footprints available of any business flatbed scanner on the market and includes TWAIN and Certified ISIS drivers. Do you want to do more with the paper on your desk? Would you like to copy it, collate it, file it, search it, mail it and make it disappear? Sounds time consuming doesnt it? How about if you could do it all with just one touch? The DocuMate 515 is powered by Visioneer OneTouch technology to scan documents using 3 present buttons for your most common destinations, yet they are completely configurable. This enables your document to be scanned with the proper settings for resolution, color, auto-crop, auto-straighten, file format and then delivered to virtually any application, folder or device - at the touch of a button! Visioneer OneTouch with Kofax VRS (Virtual ReScan ) technology is integrated into the scanner driver so that you get perfect scans from imperfect originals. VRS also eliminates the need to rescan documents through automatic cropping, straightening, brightness control and edge clean-up. Most new users in document imaging are not scanner experts, so simplified, point-and-click solutions that deliver high quality images and integration with business applications are essential.